Yugoslavia and Albania "Crack in the Iron Curtain"
1) make the South well trained enough militarily that they could withstand the North on their own. 2) Strengthen the South's government to attract the broader base. In the United States Anti-war demonstrations had become popularized around the same time President Nixon was elected on a peace platform in 1969. He wanted to find a way out of office honourably following a scandal involving the Republicans. 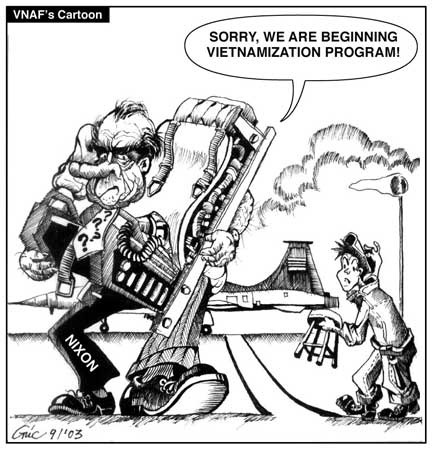 With the assistance of Henry Kissinger and Henry Cabot-Lodge Vietnamization was created. The plan was intended to Strengthen the South's government to attract the broader base, and to help the South become well trained enough in a militaristic sense, so they could withstand the North individually.